1. The HDR algorithm has increased the accuracy of the settings. 2. The rare bug with the discrepancy of the selected and supplied color of the frame in Multi-Shot was fixed. 3. The motion determination algorithm in Stabilizer was set. 4. The bug with editing video with the front camera made on third party programs was fixed. 5. The bug with editing videos of nonstandard sizes was fixed. 6. The animation speed for the weak devices was reset. 7. A more advanced algorithm mixing Average with Mediana was made in Low-Noise camera. #1 professional camera in the App Store! YES! It’s finally here… KitCamera is the premier camera for pictures, videos, and editing. What makes it unique?… It works perfectly for EVERYONE no matter what level you are. As basic or sophisticated as you want it, that’s what you’ll get from KitCamera! Simple enough for an amateur and plenty deep for a pro – a totally unique concept that ONLY KitCamera can deliver! It comes loaded with the features to create and edit professional images down to the finest detail… And yet, it’s super simple if you just want to rock a cool frame or a classic filter for your social media or friends. KitCamera is designed around the custom needs and skills of any and every camera user. In a word, it’s the one camera app that everybody is raving about! It’s fast, simple, loaded with useful features, and an amazing value! ** POPULAR FEATURE ** KitCamera lets you take photos and videos with effects in real time mode. Plus, after you’ve taken the shots you can edit the photos and remove the effects previously applied when taking photos. •	Take shots in TIFF format without compressing and quality losses. •	11 types of shooting photos and videos. •	Setting white balance and exposure in real time, while taking shots. 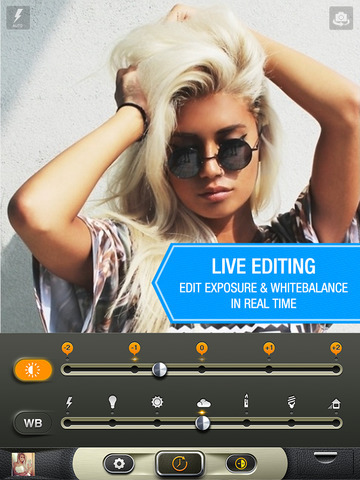 •	Take videos in full HD quality with effects applied and modified in real time. •	Adjust the focus between three modes: normal, micro and macro. •	Auto sharing and autosaving of photos and videos on: Box, Dropbox, Flickr, Google Drive, SkyDrive, Yandex Disk, VKontakte, Zenfolio, SmugMug. •	Adjust video resolution in real time while shooting videos: 1080p, 720p, 480p, 288p. •	Pause and resume video shooting. •	Preview of EXIF metadata with histogram per channel. •	Levels per channel for photo and video in the editor. •	Our editor works for both photos and videos. •	Optimization for all the latest mobile devices. •	Updates to ensure flawless use and new bonus features. •	Open the app – the camera is ready to snap! •	Slide the bar for instant zoom. 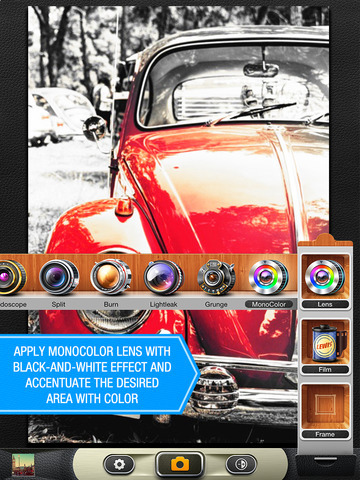 •	Tap the drawer to gain access to options for: lens, film, and frame. •	Tap the settings “Gear” and the “+ –” circle for advanced features. •	Edit, Save, and Share! KitCamera is your beginner, intermediate, and advanced camera app all wrapped up into one! 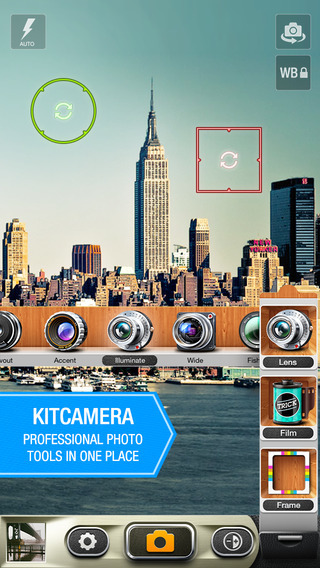 Your mobile camera solution just got really simple: KitCamera! Feel free to drop us a line! We’re always listening to your suggestions to improve KitCamera! If you have any issues with the app, just contact us and we will help you! We appreciate your support greatly! You inspire us to make more great apps like KitCamera!